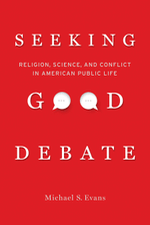 In Seeking Good Debate, Michael S. Evans examines the results from the first-ever study to combine large-scale empirical analysis of some of our foremost religion and science debates with in-depth research into what Americans actually want in the public sphere. The surprising finding? Apparent conflicts involving religion and science reflect a more fundamental conflict between media elites and ordinary Americans over good debate. Challenging our understanding of science, religion, and conflict, Seeking Good Debate raises profound questions about the future of the public sphere and American democracy. Save 30% with code 16M4197 when you order from UC Press online! Seeking Good Debate is also available from Amazon, Google Play, Barnes and Noble, BAM, Walmart, and your local independent bookstore.